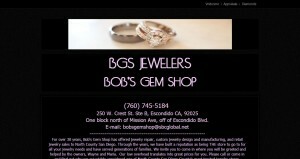 Bob’s Gem Shop address, phone, website, hours of operation, and more. 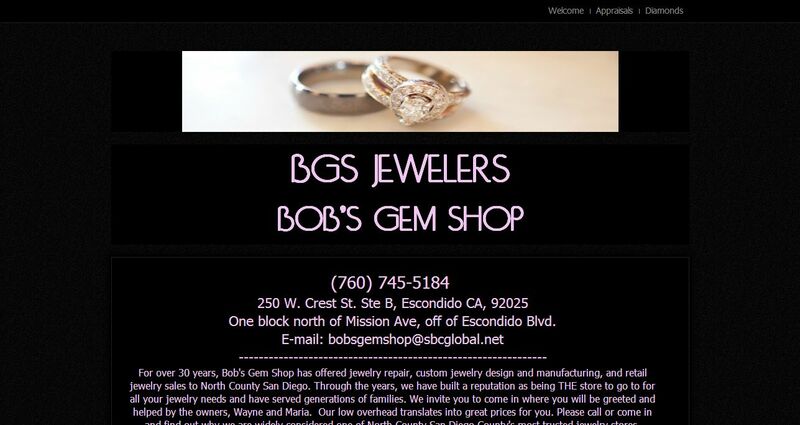 For over 30 years, Bob’s Gem Shop has offered jewelry repair, custom jewelry design and manufacturing, and retail jewelry sales to North County San Diego. Through the years, we have built a reputation as being THE store to go to for all your jewelry needs and have served generations of families. We invite you to come in where you will be greeted and helped by the owners, Wayne and Maria. Our low overhead translates into great prices for you. Please call or come in and find out why we are widely considered one of North County San Diego County’s most trusted jewelry stores. We are a full service jewelry store specializing in custom jewelry design and manufacturing, jewelry repair, and the sale of diamonds and fine jewelry. We are proud to be partnered with Gabriel & Co. of New York (www.gabrielny.com) and Varna (www.varna.com). In addition, we buy gold, sterling silver, platinum, and quality diamonds over a half carat.